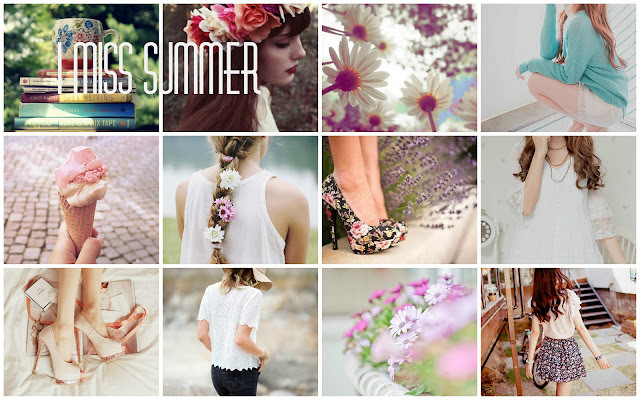 Anyway the main reason for writing this post is to express how much I miss spring/summer. Don't get me wrong I love winter (snow, Christmas, cozy outfits...) but it's kinda getting on my nerves already. It's been snowing like crazy for the past few days and it just doesn't seem that it will stop any time soon. And I hate that, because you can't function at all. I just hope winter will end soon, because I can't wait for spring to start and see what new it brings. missing summer too...but spring is ok too, haha ♥ hope will be soon! I miss summer and want it now! Congrats for reaching 400 followers, but one advice : when you ask someone to follow each other, please follow back after she follows you. I always do, but sometimes not right away because I don't have time. Oh I'm so with you..I also missing spring and summer..flower dresses..the warmth and light of the sun..and so much more..
ooh i love this post all of the flowers!!! come check out my new post!!! I miss summer too! Lovely images! Congrats for your 400 readers - you earn it! Congrat! You have another follower beautiful. Spring will come. And love the pics you have put up for summer - so beautiful! I love that floral printed pumps! So cute! Summer here in country will be next month. Lovely pics! I like it so much! Thanks for your comment dear and the idea to follow each other! Nice pics, I miss summer too! Just went on a short break to Spain, and I don't wanna go home (to the snow) again!!! Thanks for your comment on my blog. Ofcourse I wanna follow eachother, following you now! Love summer and cant wait! Congrats!!!! In the spirit of everything, I'm giving you a Beautiful Blogger Award. Details are on my site. Me encanta tu estilo!! y me encanta tu blog!! Te sigo para quedarme y poder ver más entradas tuyas!! te animo a que visites mi blog y me sigas si te gusta! !